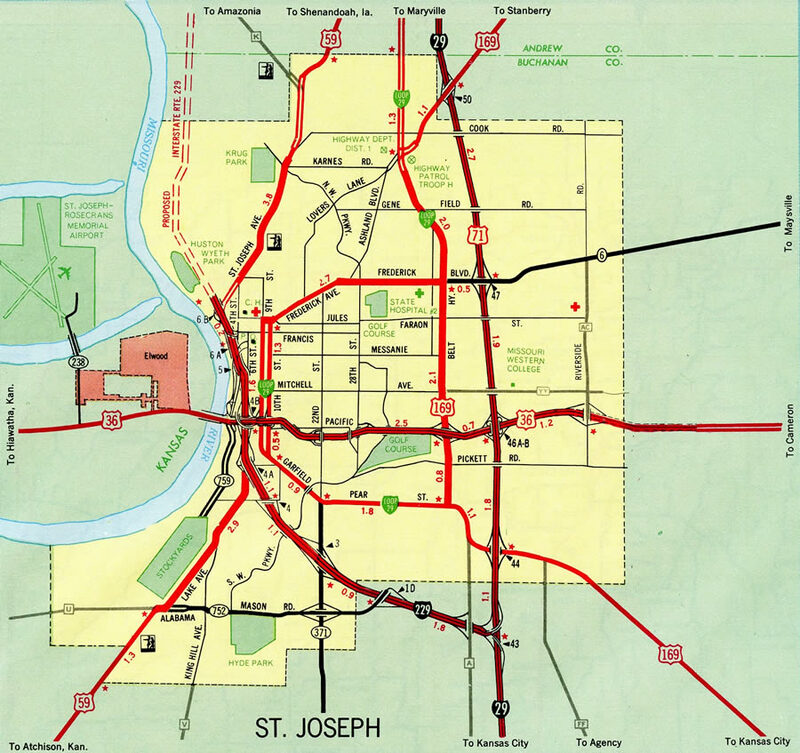 Interstate 229 forms an urban loop west from Interstate 29 through the city of St. Joseph. The freeway carries four overall lanes with rural stretches leading through Buchanan County to the south and Andrew County to the north. 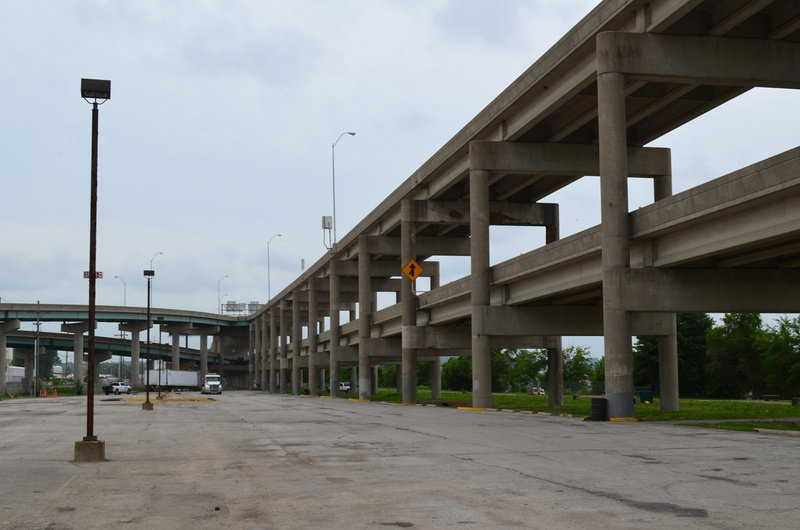 Through Downtown and along the Missouri Riverfront, Interstate 229 combines with U.S. 59 along a double deck freeway. 2015 traffic counts recorded by MoDOT peaked at 16,810 vehicles per day (vpd) east of Exit 1D (MO 752), while the roadway north of Exit 11 (Highway K) was lightly traveled with just 4,646 vpd tallied. 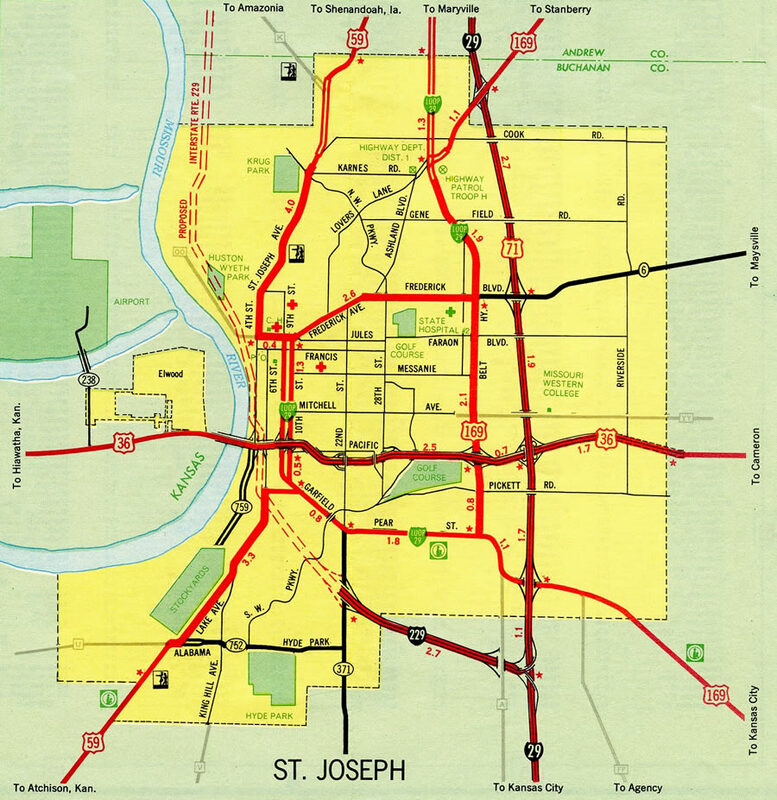 St. Joseph is also served by a business loop from Interstate 29 along a combination of surface streets and shared alignments with U.S. 59 and 169. Flyovers join the double deck freeway with Downtown St. Joseph as Interstate 229 & U.S. 59 travel between railroad lines and the St. Joseph Riverwalk. Photo taken 06/18/15. The 1975 Missouri Official Highway Map shows a 2.7-mile spur of I-229 open to traffic. A 1970 Missouri map shows this southernmost segment open to traffic. 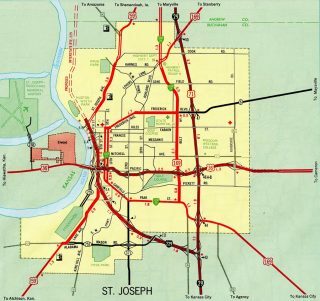 Interstate 229 was extended north to the St. Joseph Avenue wye interchange on the 1983-84 Missouri Official Highway Map. The I-229 freeway winding north from the U.S. 59 (St. Joseph Avenue) split was constructed through bluffs rising from the Missouri River. Interstate 229 rises from Dillon Creek by agricultural areas on the approach to Exits 14A/B/C with I-29 and U.S. 59-71 north. Photo taken 06/18/15. Exit 14A leads drivers back to the southeast along I-29 & U.S. 59-71 to Business Loop I-29 & U.S. 59 south to Country Club and U.S. 71 Business north to Savannah. Photo taken 06/18/15. Exit 14B represents the I-229 northbound mainline transition to U.S. 59 & 71. The two US highways split with I-29 north to bypass Savannah. U.S. 71 advances northward from there to the Nodaway County seat of Maryville while U.S. 59 turns west to combine with Interstate 29 across the Nodaway River to Oregon. Photo taken 06/18/15. An end sign appears for I-229 as the left-hand ramp (Exit 14C) departs for Interstate 29 north to Council Bluffs, Iowa and Omaha, Nebraska. Photo taken 06/18/15. A set of shields stand at the Exit 14C gore point. U.S. 71 leaves the I-29 corridor here for a rural route north to International Falls. U.S. 59 intertwines with the freeway northwest to Craig. Photo taken by Jeff Royston (03/16/05). One mile south from the return of Interstate 229 north from St. Joseph on I-29. Photo taken 11/03/16. U.S. 59 merges with Interstate 29 & U.S. 71 for 2.8 miles from near Country Club to a freeway extending north from I-229 to Savannah. Photo taken 11/03/16. Exit 56B joins Interstate 229 for return access to St. Joseph as I-29 travels solo to the northeast of Amazonia. Photo taken 11/03/16. U.S. 59 & 71 travel a freeway south from the Andrews County seat of Savannah to directly transition into Interstate 229 south at forthcoming Exit 56. Photo taken 06/18/15. A directional cloverleaf interchange with left-hand ramps facilitates movement to Interstate 229 south to Downtown St. Joseph and U.S. 71 north to Maryville. Photo taken 06/18/15. Exit 56B leaves I-29 south for Interstate 229 as U.S. 59 & 71 merge onto the freeway south. U.S. 59 briefly overlaps with Interstate 29, before combining with Business Loop I-29 south to the village of Country Club. U.S. 59 also serves Downtown, where it joins the double decker section of I-229. Photo taken 06/18/15. U.S. 59 & 71 traverse hilly terrain south from Hopkins Creek to the unnumbered interchange with Interstates 29 and 229. Photo taken 06/18/15. Interstate 29 angles northwest along the Missouri River bluffs to Mound City, Craig and Hamburg, Iowa on the 116 mile drive to I-80 at Council Bluffs. Photo taken 06/18/15..
A left-hand ramp follows for the continuation of U.S. 59 & 71 south onto Interstate 29 as the freeway bypasses St. Joseph to the east. Photo taken 06/18/15. The first mile marker for I-229 south once stood adjacent to the on-ramp from I-29 north. Milepost 14.8 was removed by 2013. Photo taken by Jeff Morrison (08/21/06). Older shields were posted across from milepost 14.8 for the separation of Interstate 229 south from U.S. 59 & 71. U.S. 59 and I-229 overlap for 1.8 miles from the Missouri Riverfront at Downtown to South 6th Street. Photo taken by Jeff Morrison (08/21/06). The final three ramps from Interstate 229 south are unnumbered. Departing first is the exit for Highway A (40th Street) to the south suburbs of St. Joseph. Photo taken 06/18/15. An end I-229 sign accompanies the ramp separation for I-29 & U.S. 71 north back through St. Joseph to Council Bluffs, Iowa and I-29 & U.S. 71 south to Kansas City. Photo taken 06/18/15. Interstate 29 & U.S. 71 traverse a series of rural hills by the Pigeon Hill Conservation Area ahead of Interstate 229 and the St. Joseph area. Photo taken 11/03/16. Interstate 229 provides a direct route to the U.S. 36 freeway west across the Pony Express Bridge to Elwood, Kansas and Rosecrans Memorial Airport (STJ). Photo taken 11/03/16. Exit 43 is the first of five interchanges for St. Joseph along Interstate 29 & U.S. 71. The tandem pass through eastern reaches of the city by Missouri State Western University while I-229 branches northwest toward the St. Joseph Stockyards along the Missouri River. Photo taken 11/03/16. Exit 43 parts ways with I-29 & U.S. 71 north for Interstate 229. The freeway loop reaches Downtown in 6.5 miles. Photo taken 11/03/16. Interstate 29 & U.S. 71 advance south from U.S. 169 and the end of Business Loop I-29 to a semi directional T interchange (Exit 43) with Interstate 229 leading back north to St. Joseph. Photo taken by Joseph Barnes (08/14/16). I-29 & U.S. 71 continue uninterrupted south seven miles to Faucett while Exit 43 provides a direct route to Missouri 752 west for south St. Joseph and U.S. 59 southwest to Atchison, Kansas. Photo taken by 06/18/15. “What’s the future of the double-decker?” St. Joseph News-Press, July 6, 2016. “MoDOT finds no evidence of falling I-229 concrete.” St. Joseph News-Press, June 4, 2015. 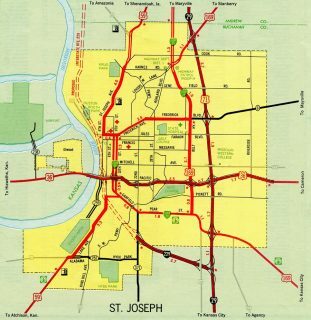 “Interstates celebrate golden anniversary Last section of I-29 opened in July 1976 ” St. Joseph News-Press (MO), June 26, 2006. Page updates November 10, 2016.